Evian has added Virgil Abloh to its list of star collaborations. To design its latest limited-edition glass bottle, the bottled mineral water brand called on the multitalented Louis Vuitton men’s artistic director, Virgil Abloh, whose expertise extends beyond the fashion world, with skills including DJing. This 75cl glass bottle will be available in limited quantities at select retail locations in the US, to be confirmed, and in Europe at locations listed on the brand’s global website including Paris’s La Grande Epicerie and Berlin’s Kadewe, starting early next month. The collaboration also includes a refillable Soma glass water bottle with an easy grip protective silicone sleeve. 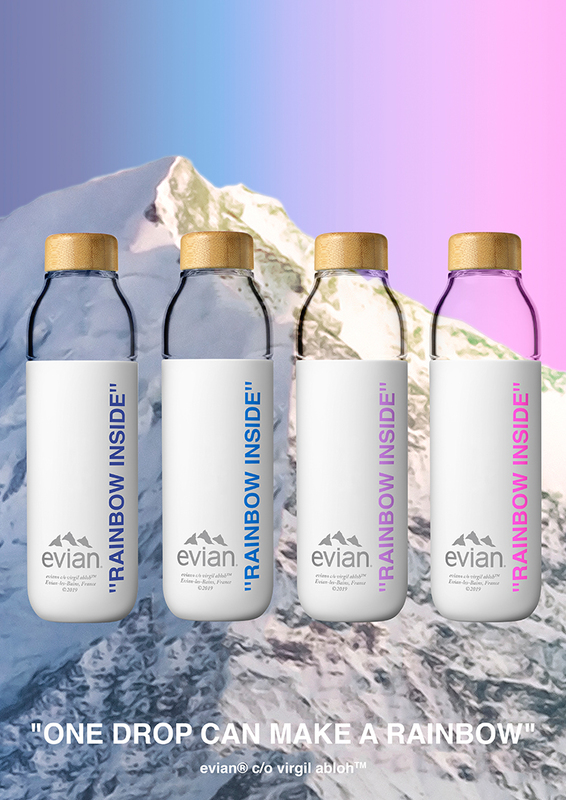 On this design, Virgil Abloh has penned, “rainbow inside.” The bottles are available priced US$48 from Matchesfashion.com. Virgil Abloh has previously branched out from fashion with collaborations including furniture design for Ikea and designing a Moët&Chandon champagne bottle.